The Constant Wife is a True Gem, Exploring the Pithiest Questions with a Light Heart and Lots of Laughs. 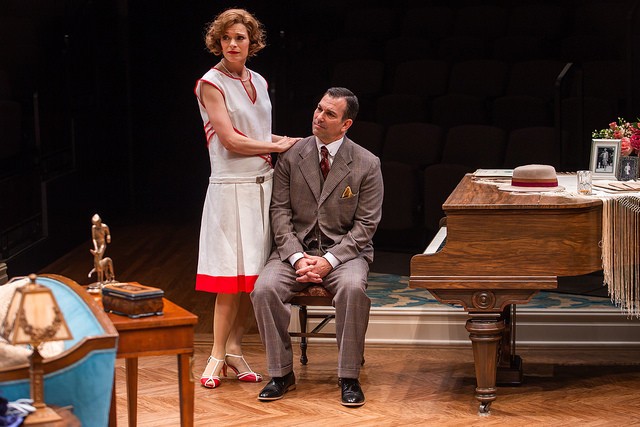 I recently had the good fortune to see Somerset Maugham’s comedy, A Constant Wife, which runs now through Oct 21st at the DCPA. 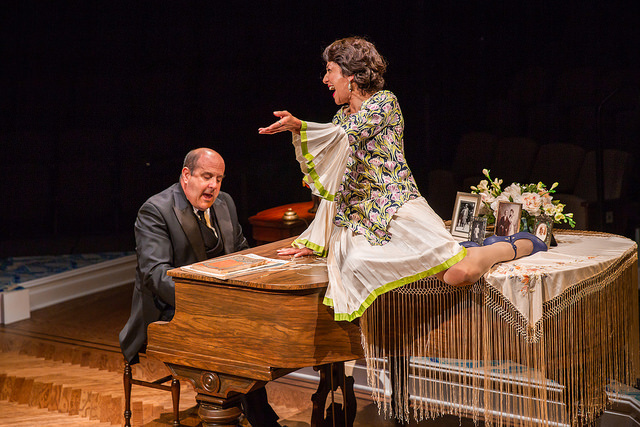 This delightful theatrical offering delivers a heavy-hitting punch tucked in a velvet glove. A Constant Wife is feminist play written in the 1920’s. It’s themes of economic and sexual liberation within marriage, were no doubt shocking for audiences in it’s day. Although it was written nearly one hundred years ago, it still feels fresh, relevant, and satisfying. Not your typical heroine, Constance, winningly portrayed by Gretchen Egolf, is clever and dispassionate, taking her husband’s infidelity in stride and turning the tables to her own advantage, without a trace of rancor. Where others would be falling out of their chair with bitterness, Constance is cool-as-a-cucumber, exercising self-determination and zen-like detachment, with humor and aplomb. She is neither naive, nor calculating, yet she is able to plan, make decisions, and choose her own path. She’s having fun, and it’s extremely entertaining. 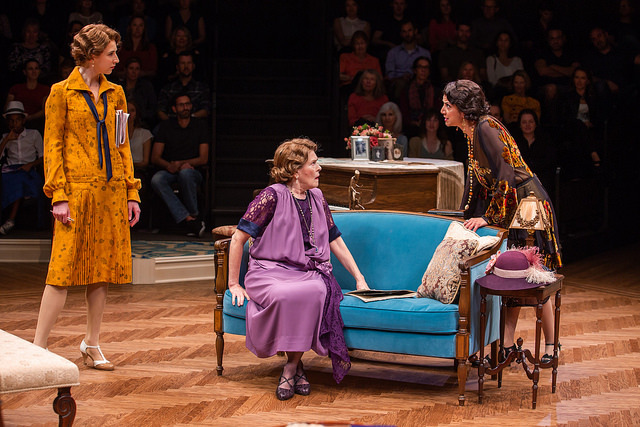 Constance enjoys her position in a wealthy household, but when her well-heeled friend Barbara (elegantly portrayed by Miriam A. Laube) offers her a job as an interior decorator, Constance weighs her options, and seizes this opportunity for economic independence. If a man buys his wife in marriage, Constance has decided to push the boundaries of what defines a marriage, by buying herself back. She doesn’t want to leave the marriage, she just wants to turn convention on it’s head, have her cake, and eat it too. Julia Knitel is Constance’s nosy and sour younger sister, Martha. She chomps at the bit to inform Constance of her husband’s infidelity. But Constance explains that she and her husband, John, each fell out of love at the exact same time, years ago. Our heroin is operating out of an unexpected framework, that is not cold, not hot, just clear-thinking and ultimately winning and bold. 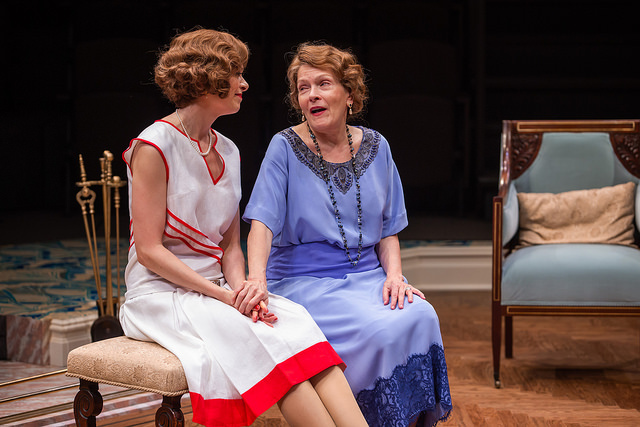 As Constance’s mother, Carol Schultz is a believable foil of conventional thinking. Trying to school her daughter in the belief that it’s okay for a man to stray, but not okay for a woman to do the same. Mrs. Culver embraces this double standard wholeheartedly, all the while saying that men are like children, and women are the real grown-ups. But when an old suitor pays a visit, Constance asks her mother to stay with them if the man is dull, but leave if he’s interesting. 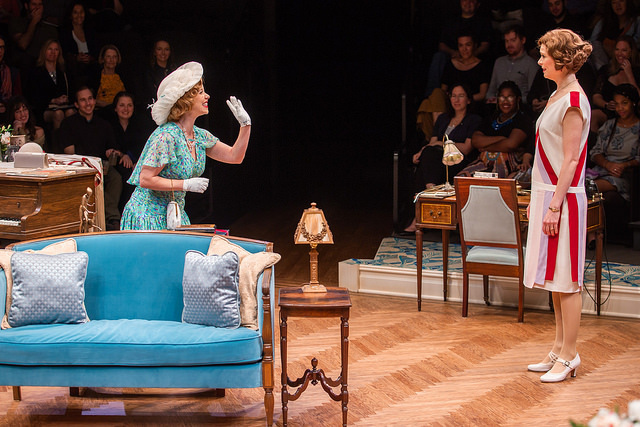 They agree on a code in order to communicate, which results in some of the play’s most hilarious moments, that had the audience rolling with laughter. As the other woman, Marissa McGowan is adorable and charming, a hapless fem fatale. Constance is best friends with her husband’s mistress, but once Constance is told about the affair, Marie Louise is unable to enjoy the no-longer illicit romance, and Constance can no longer look the other way. Rodney Lizcano is appropriately rueful and irate as Marie Louise’s husband who’s suspicions are turned on their side, as he is assured all is well. Somerset Maugham depicts a world where all is well as long as no one admits what they’re really doing. Maugham pokes fun at people’s masks, hypocrisy, and frailties, all the while exploding through pretense with a sense of fun and a feeling of– why not? Is the truth really so unpleasant? As husband John, Robert Mammana is the seemingly perfect doctor, romancing Marie Louise under the guise of needing time away to tend his patients. With understated exuberance, he runs the gamut from lothario to cuckold, and back again to a love-struck fool stripped of his defenses. As the hopeful suitor, Estes Tarver is a gentleman, sincere, at times insecure and shy. Constance mentions that he was too willing to roll over for her when they were young. But could she decide to go for it, and see what it’s like to be adored, even after her own marriage has grown stale? Will her bold move ignite her husband’s regret, and indeed his passion? Is romantic love just a tug of war? This play, even with all it’s social relevance and depth, brings to mind the energy and manic pace of a Marx Brothers film, reminding us that the pithiest questions are good to contemplate with a light heart and lots of laughs. There is even a musical number, lead by the butler, where the lovely Barbara cuts a rug. You don’t want to miss this special gem of a play. It will make you smile as well as think. 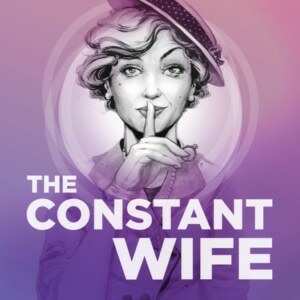 THE CONSTANT WIFE is delighting audiences now through October 21st on the newly remodeled Space Theatre at the Denver Center. For tickets or more information, contact the Denver Center Box Office by calling 303-893-4100 or online at www.denvercenter.org.